It’s Friday so that means we have more new music for you to check out this weekend! There’s a few late to arrive recent releases but we are sure glad they’ve rolled in! The latest from The Coathangers, Brian Jonestown Massacre, Weezer, Skinny Lister and Strand of Oaks have all arrived plus an album that after being recorded nearly 40 years ago has now been released. Check out all the details below. 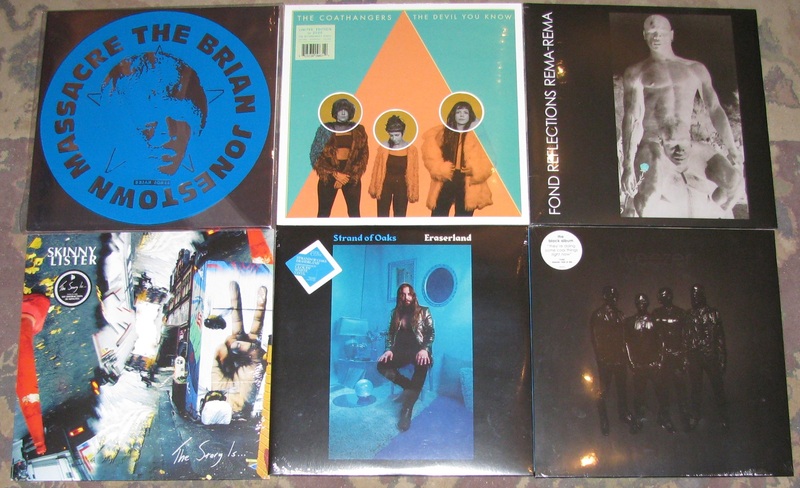 No restock list this week but there’s always new stuff sneaking into the browsers here at Backbeat so come have a dig. Let’s get to our featured recent releases! Superb deluxe packaging heavy board 180g clear vinyl and printed plastic sleeve. Brian Jonestown Massacre burst into 2019 with the release of their 18th full-length album, just 7 months after their last one. It was recorded and produced at Anton’s Cobra Studio in Berlin. The album was originally going to be released in September, but due to a hugely successful global tour – taking in USA, Canada, Australia, New Zealand and Europe the release was delayed. Recorded this time last year, the album features Sara Neidorf on drums, Heike Marie Radeker (LeVent) on bass, Hakon Adalsteinsson (BJM / Third Sound & Gunman & Holy Ghost) on guitar and Anton Newcombe on multiple instruments. Also making a guest vocal appearance on ‘Tombes Oubliées’ is Rike Bienert who has sung on previous BJM albums. This record wasn’t supposed to be here. I had thought for a moment Strand of Oaks might be over until a text from my friend, Carl Broemel, changed all that. Unbeknownst to me, four members of My Morning Jacket and Kevin Ratterman booked studio time to record songs I didn’t think I’d ever write. But they believed I could and pulled me back from the brink. At last, the songs came–and quickly morphed into everything I’ve ever worked toward as this band. These ten songs are about existing and continuing on, a testament to the hope that even if we feel like we are disappearing, there is that glimmer of light. You may not come out the same person you started as, but that’sokay. I’m glad this record is here now for whoever chooses to find it. Welcome to the dark side. The new album from rock legends Weezer, featuring the hit “Can’t Knock The Hustle”. Hailing from Los Angeles, CA, Weezer – Rivers Cuomo (vocals/guitar), Brian Bell (guitar), Scott Shriner (bass), and Patrick Wilson (drums) – has sold over nine million albums in the U.S. and over 17 million records worldwide. The alt-rock band has proven themselves a force in the industry with a 20-year catalog that features chart-topping hits such as “Buddy Holly,” “Say It Ain’t So,” “Hash Pipe,” “Beverly Hills,” “Perfect Situation,” “Pork and Beans,” “El Scorcho,” “Island In The Sun,” and more. April 13, 2019… Say no more!